"Seeing children treated like this is against what we all believe,” says one immigration advocate. Americans did not start fighting the Trump administration’s new policies to detain Latino migrant children until doctors pointed out the permanent and harmful effects on the kids, pediatricians and other experts said Monday. Once pediatricians, especially, started calling the detentions abusive, support for the policies began to fall apart, American Academy of Pediatrics president Dr. Colleen Kraft said at a seminar. “We know that separating parents from children is not a great idea. But science tells us this is actually child abuse,” Kraft told an audience at the Bloomberg School of Public Health at Johns Hopkins University. “Even if you are on the right, seeing children treated like this is against what we all believe," said George Escobar, program chief for CASA, a Maryland-based immigration aid charity. It is important to keep pointing out the facts as the administration attempts to harden those policies, the panel of experts said. The New York Times reported last week that 12,800 children are being held in contracted shelters for migrant minors this month, despite a June executive order that reversed the Trump administration policy of forcibly separating children from parents. Many of those being held traveled alone to the border, but some are still being kept apart from parents who were with them at the time. 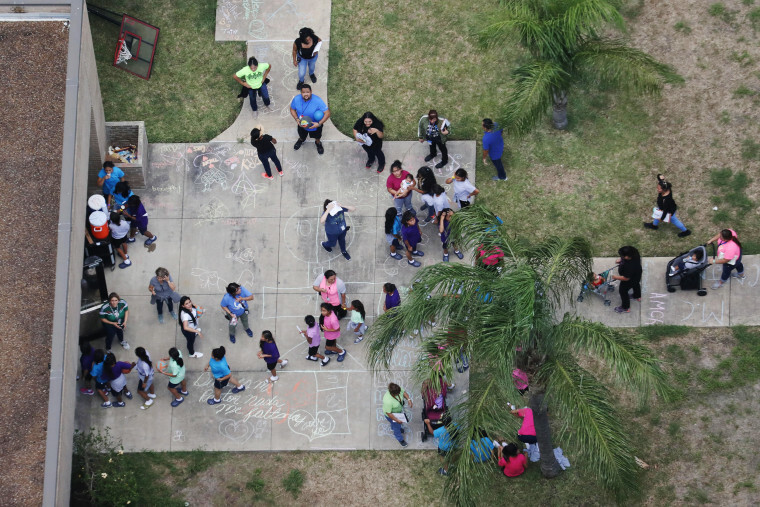 And despite pressure from members of Congress horrified by the backlash from child advocates, the Trump administration is seeking to reverse the 1997 Flores settlement agreement, which says children cannot be held in detention longer than 20 days. “The bad news is this administration has not demonstrated an interest in humane alternative measures,” said Eric Schwartz, president of Refugees International. Kraft visited one of the detention centers earlier this year and did many interviews describing the pitiable effects on the kids. “You could see that these children needed something that none of us could give them: their parents,” she said. Even a short separation can damage the mental health of a child, and the conditions at some of the centers can harm physical and mental health alike, Kraft said. These include a lack of proper food and water and harsh lighting 24 hours a day, which interfere with proper sleep. “We know that many kids that are given back to their parents are different kids,” she said. Children are not given adequate legal help, and Kraft described instances where 2- and 3-year-olds were given papers to read that described their rights and how to find an attorney. “That’s insane,” she said. “None of us want to hurt children. Everybody from both sides of the spectrum said, ‘OK this is wrong. We have to change it,' ” Kraft said. And even resident U.S. citizens are being hurt by the policies, Kraft and others said. “One out of 3 children in the United States live in families with mixed immigration status. These families are scared. They are scared to get the services that are needed for their children who are citizens,” Kraft said. Families are dropping children from Medicaid and from food aid programs, and even keeping them home from school for fear of being brought to the attention of immigration enforcement, Kraft said. And the policies do not deter immigrants and asylum-seekers, who usually are not aware of them anyway, said Paul Spiegel, director of the Johns Hopkins Center for Humanitarian Health. He said outlining these effects can help change minds and give ammunition to opponents of the policies. “We need to craft our policies according to evidence,” Spiegel said. It may also help to document the fact that many of those showing up at the border truly are fleeing terrifying and life-threatening violence in their home countries. “People do not really understand what is going on in the northern triangle of Honduras, El Salvador and Guatemala,” Spiegel said.